You would have to be living under a rock to have not heard the resounding thud of the Ontario Auditor General’s report on the state of emergency management in Canada’s most populated province hitting the desks of the emergency management community in Canada (report) . I for one was not shocked by the findings and believe most jurisdictions in Canada would see similar criticism if subject to an OAG review. I am hopeful that the public shaming of our most densely populated economic engine, will lead to a national discussion of the investment required to truly meet the realities and expectations of modern emergency management.There are already several emerging national strategies that will aid in this effort, Canada’s emerging Broadband Public Safety Network and the expanding National Public Alerting Systems are modern capabilities that will go a long way to enhance capacity at even the most modest EMO. I know my former colleagues in the EMO’s across Canada are shifting uncomfortably at there desks at the moment waiting for their own leaders to ask how they compare to Ontario. It would seem to me that if your not uncomfortable you just don’t get it. Lee Spencer is founder and President of Spencer Emergency Management Consulting. 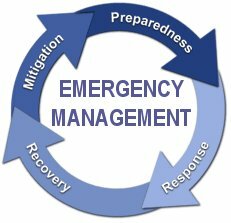 The company is focused on the strategic integration of emergency management concepts towards an outcome of resilience within a community, business or government. This article was first published Spencer Emergency Management Consulting e-blog site.